Today I’m sharing some of my favorite pieces from Brett Johnson’s AW ’15 collection since it’s finally weather appropriate in LA. 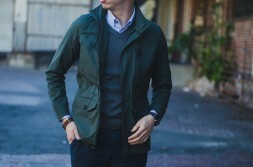 I love outerwear because it gives you the perfect balance of one stand out piece mixed with functionality. Puffy vests are great to layer with turtlenecks or thermals. They provide added warmth and are a cool fashion statement. I’m also a big fan of lined jackets. This brown sheepskin is great to dress up a jean and boot look, or play down some simple trousers. This jacket is sure to turn heads (as it did in DTLA when I rocked it). A grey overcoat is one standout piece that every gent should own- It’ll match with almost any suit in your closet, and looks neat and streamlined with a monochromatic OOTD. You see all those dudes on IG wearing them with a tee shirt and ripped denim, give it a go, you wont regret it! I’m all for subtle statement pieces that’ll make a pop to any outfit. Brett Johnson offers a variety of high quality items guaranteed to get you through Winter! Check out how I styled a few of my favorite Brett Johnson Pieces. I’m a huge fan of the shearling jacket..I have yet to see one in person but I know it would turn heads for sure.